Emil's uncle got a phone call that Emil was arrested. 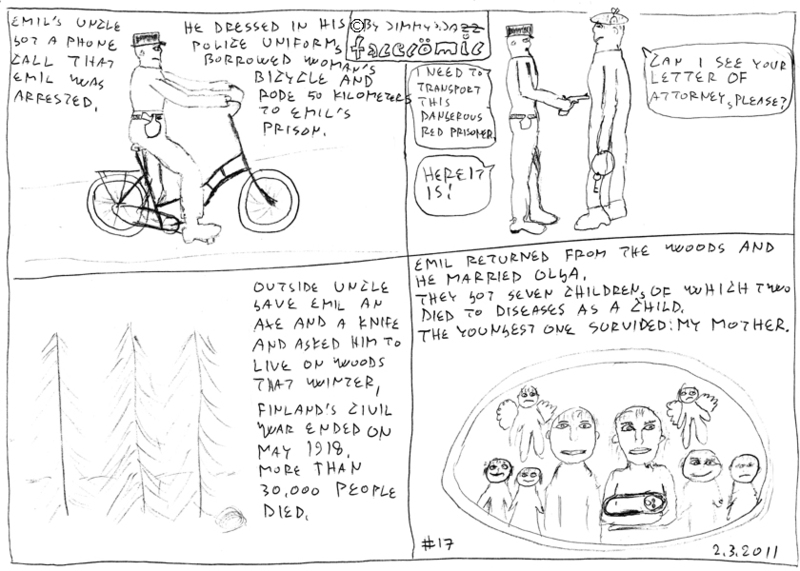 He dressed in his police uniform, borrowed woman's bicycle and rode 50 kilometeres to Emil's prison. - I need to transport this dangerous red prisoner. - Can I see you letter of attorney, please? Outside uncle gave Emil an axe and a knife and asked him to live on woods that winter. Finland's civil was ended on May 1918. More than 30.000 people died. Emil returned from the woods and he married Olga. They got seven children, of which two died to diseases as a child. The youngest one survided: my mother.